Summer berries are in full swing, and in our house that mean it’s Jamming Season! Getting creative with jams is so much fun. We love making small batches so we can test out different flavor combinations. And if we’re really thinking ahead, summer jamming time is the perfect time to think about stocking up on Christmas gifts. (I know, we’re getting started REALLY EARLY!) We love giving useful homemade gifts, and gift baskets featuring an assortment of summer jams is a fun gift idea that makes the berries of summer last all year long. Today we’re sharing our favorite way to make and can jam – without added commercial pectin and without the pesky water bath. Let’s dive in! You can’t have a jam without your base, and most of the time that is going to be fruit. Fruit for jamming should be firm and ripe (but not over-ripe). Fruit isn’t just an essential base, fruit provides our jam with natural pectin – that magic substance that creates the gelling that we are looking for in our preserves. Many recipes will call for you to add commercial pectin, which will amp up the gelling capability of the fruit, resulting in a jam that takes less boiling time. To add or not to add commercial pectin is a personal choice. But, most often I won’t add pectin because I love the thick, fruit-preserve texture and flavor that comes from just using the fruit’s natural pectin. Acid is essential to jam because it helps the pectin create that beautiful gel. Typically, fruits that are high in pectin already have enough acid to gel properly. But low-pectin fruits tend to be lower in acid, meaning that you need to add some high acid fruits or lemon juice to get the acid balance right. Wash your fruit and remove any stems. Once the fruit has come to a boil, add the sugar and stir until it has dissolved. Turn up the heat and bring the mixture to a rolling boil that can’t be stirred down. The mixture will sputter and foam. That foam won’t do any harm, and you can always skim it off before filling your jars. After your sugar and fruit mixture comes to a rolling boil, you will reach the jellying stage. Depending on the moisture level of the fruit, it could take anywhere from 5-20 minutes of boiling. Once the mixture starts to thicken, you will need to test for the gel. There are three options to test if your jam is set and ready to be canned. Temperature test – The ideal jellying temperature is 220°F for a nice, spreadable jam. Take the temperature using a candy thermometer and be sure to stir the jam thoroughly before taking the temperature. Freezer test – While your jam is cooking, place a small plate in the freezer. Once your jam starts to thicken, spoon a small amount of the mixture onto the plate and place it back into the freezer for 1 to 2 minutes. When you remove the plate from the freezer, your jam shouldn’t feel hot or cold. Press the jam with your finger, and if it wrinkles it’s done. As an added test, you should be able to trace your finger through the center of the puddle of cooled jam, and the jam should stay put. Spoon or sheet test – Dip a cold metal spoon into the boiling mixture. Away from the heat, tilt the spoon, so that the mixture runs off the side of the spoon. When the mixture slides off of the spoon in one smooth sheet, it has reached the jellying stage. Fill your clean (hot) jars with the jam, leaving about ¼ inch of head space before the rim. Wipe the rim of the jars clean with a damp towel, and top each jar with a clean, fresh canning lid. Tighten the bands on the jars firmly. After the jam has cooled, remove the bands and do a good check on the seal of the lids. Any jars that have not sealed should be refrigerated. Then, give your jars a good wipe down before replacing the bands and storing the jars. If you would prefer to can the jam using a water bath canner, you can find detailed information on the Water Bath Canning Process on my website. If you like the science behind the jamming process, check out this Preserving Fruit: Jam Basics article. 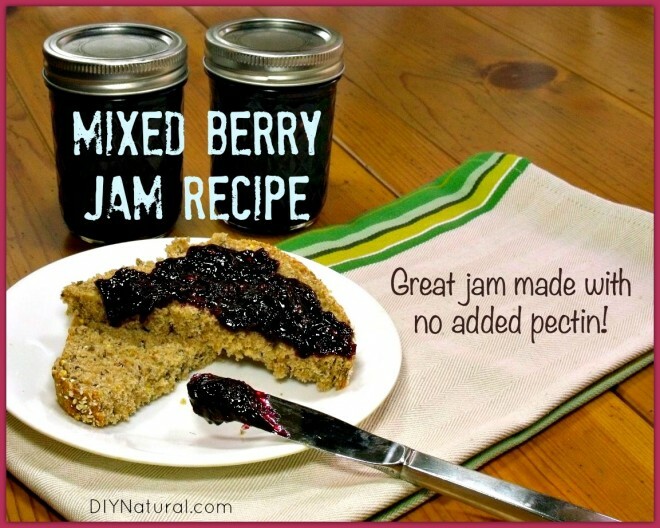 Have you made no-pectin jam before? How did it turn out? Thank you soooo much for this recipe! I have made it twice now, two different versions. The Low/High Pectin info is GREAT! 1st batch: 4 c. strawberries, 4 c. blueberries, 4 c. raspberries (double recipe). It took MUCH longer to get to the gel stage than indicated, but it worked and ALL my jars sealed…loved not having to water bath can this! 2nd batch: 6 c. peaches, 6 cups raspberries (double recipe). Again, took much longer than indicated, but delish! For my double recipes, I also only got 4 pint size jars. The second batch, when I did the plate freezer check, I stopped just “shy” of getting wrinkles and it still set perfectly. I wonder if I can go even less and thus evaporate a little less water and get closer to the quantity indicated here? None-the-less, I’m hooked and love that I don’t have to use store bought pectin and this is less sugar anyway! I might also see if I could get away with 1/2 c. less per batch? I know sugar is needed, but I would love to use even less. Thanks for your comment. I’m so glad you love the recipe and you’re having good luck with the French Canning Method! The reason your batches took longer to gel than indicated is because you doubled them. Doubling the ingredients means that there is more moisture to get out of the jam before you can hit that jelling point. That’s interesting that you only got 4 jars from the double batch. The only think I can think of is that with the longer cooking time, they did reduce more. My suggestion would be to either stick with single batches or try making your double batches in the widest diameter pot you have. Using a pot with a wider bottom gives the jam more surface area to evaporate moisture, so it should read the gelling point quicker, and give you a higher yield too. If you stop your cooking too early, you do run the risk of having a runny jam, but cooking time is definitely something you can play around with to see what works best for you. I’m right there with you on wanting to use as little sugar as possible in jams. But, like you said, sugar is necessary. If you want to try reducing the sugar even more, I would suggest trying a small batch to see how it sets up and keeps. Sugar helps pull the moisture out of the fruit and binds with it, making way for the pectin to do its thing, and it also creates an environment that is not hospitable to the growth of other microorganisms (those guys we really don’t want in our jam). So, you really do want to watch your jams carefully as you take the sugar down, not only are you playing with the ability to gel, you’re also playing with a big ‘preservative’ of the jam. Just things for you to think about as you’re having fun making your jams. If you do try it with less sugar, I’d love to hear how it turns out for you. Thank you so much for the extra info! Well, that was so interesting. I will have to try the French canning method, and thank you for teaching me about that. I wouldn’t ever keep my jars hot in an oven, as my old oven leaks heat into the room and summertime is usually when I’m making jam—-so it’s hot enough in the kitchen already. My Mother taught me to boil a huge pot of simmering hot water and keep the jars hot that way, as well as the lids, and to use tongs to remove jars from the water. (I bought a small magnet, the retractable kind you can clip onto your shirt like a pen, and I use that to retrieve the hot lids from the bottom of the pan.) That way the jars and lids are sterilized and they are plenty dry when you remove them from the water to ladle in the jam. When I was traveling in Australia, bush camping, I took my terrific Sears stainless steel 6-quart pressure cooker along and used that (not pressurizing) to cook jam. We would pick strawberries or blueberries or blackberries at various “pick your own” fields and I made *the best* jam using only lemon juice (as my Mom taught me) and sugar and no pectin. Glad I saw this article and thank you for the nice recipe, too. I can’t wait to try it. Thanks for sharing your experiences. Those jams sound wonderful! The simmering water method to sanitize the jars is another great option, particularly if you are using a water bath canner and will need to have simmering water ready. Happy canning! Is it possible to freeze jam made this way? I really like the idea of not adding commercial pectin but I have always made freezer jam. Thanks for sharing your knowledge/experience! Hi Sarah, I don’t have any experience with freezer jams, but I don’t see why you couldn’t freeze this jam. If you give it a try, be sure to stop back by and share how it turns out for you! Hi, this is the second year I have made a similar recipe. I use freezer safe jars and the jam freezes just fine. I use honey instead of any sugar. The consistency is a little runny, but still spreadable and oh so good. Thanks for sharing Laurie. It is good to hear someone had a good experience freezing a similar recipe. It makes sense that using honey would create a bit more of a runny jam, but I’m sure it’s just as tasty! I’m so glad to hear your experiences using the French Canning Method. Last year I read a book that used it as some of the preservation methods. And I thought it would be perfect as I have a very small place and no space to store or use water bath canning methods. My one concern was the safety aspect. Good to know there’s minimal risk if the lids seal correctly. And I didn’t know how to tell if they did or not. Hi Andresa, The French Canning Method is great if you don’t have the space for all the bath canning equipment. After the jam has cooled and you remove the bands to check the seal, you should not be able to remove the lids with just your fingers and the center of the lids should be depressed slightly. Happy canning!